Click: Breeding the Melba Finch (Green-Winged Pytilia), Pytilia melba – Part 1 to read the first part of this article. 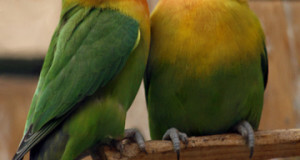 The Melba finch’s beak is much thinner than that of those finches, such as the Gouldian, that rely on a seed-based diet. In the wild this species consumes a good deal of insect prey, and such is particularly important in bringing the birds into breeding condition, and when they are raising chicks. This is true of Melba finches to a much greater extent than for any other finch species. Melba finches do well when provided with small crickets and mealworm grubs and pupae, but increasing the dietary variety is always a good idea. Waxworms, Canned Caterpillars and insects collected with Zoo Med’s Bug Napper Insect Trap (moths and small beetles are especially favored) will help assure your success. Higgins Eggfood is indispensible for Melba finches, both in and out of the breeding season. The young are fed entirely upon insects for at least 10 days after hatching, so be sure to have plenty on hand. In addition to the aforementioned foods, the basic adult diet should consist a mix of high quality Finch Seed, sprouts and a bit of romaine and other greens. Melba finches in the wild and in outdoor aviaries forage mainly on the ground. Dry hay or grass can be placed on the cage bottom – insects or seed scattered within this will keep them occupied for hours. Although success has been had in fairly small cages, I would suggest using one along the lines of the Blue Ribbon Peaked Bird Cage. 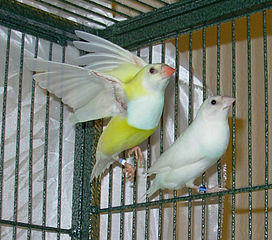 Melba finches favor an open wicker cup as a nesting site, which should be situated behind Hanging Silk or live plants. The male will indicate his breeding readiness by singing and commencing nest-building (provide dry grass or 8 in one nesting hair). Females lay 3-6 eggs, which are incubated by both parents. Most importantly – these birds will not tolerate nest inspections. Doing so almost guarantees that they will toss the eggs from the nest. The eggs hatch in 12-13 days, and fledging usually occurs at day 19-21. The fledglings are fed by the parents for approximately 2 weeks after leaving the nest. They should be removed shortly thereafter, and can be kept as a group for 7 months to 1 year. However, I suggest splitting them at age 5-6 months, as aggression triggered by maturity can come on quite suddenly. 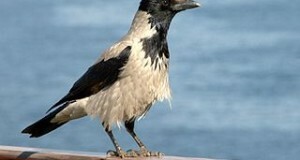 Adult plumage is attained at age 7 months, but birds rarely breed before 2-3 years of age. Click here for an image of the Melba Finch. 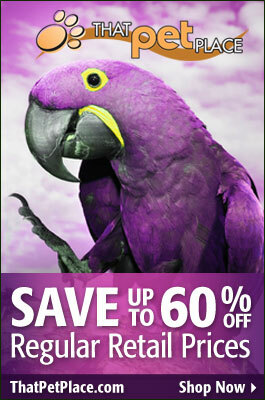 Next: Avian Health Concerns: “My Parrot Seems Healthy, but Sometimes Passes Whole, Undigested Seeds in its Stool. Is this Normal”?